Thank you! Your request has been successfully received! We will contact you shortly with suggestions for venues. Thank you for using the Restaurant Guides event booking service. Planning a special event or night out? 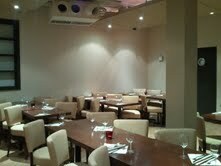 Looking for a place to go for a christmas party, private party, conference, birthday or anything else? Fill in the form below with a few simple details and we'll do all the legwork to find you a great venue! Make sure to enter your contact details correctly so we can inform you of all the details of venues that meet your requirements. Any further details relevant to your occasion. Type of Occason: Christmas party, office function, conference, etc. Location: General location of your event.